If you’ve got money worries, getting your power disconnected because you couldn’t afford to pay the bill might be the last straw – especially if it happens in the middle of a cold snap. Apart from the terrible inconvenience of not being able to cook on your stove or heat your home — on top of all that, you will receive a hefty reconnection bill as well. You really want to avoid getting disconnected. It is important to tell your electricity provider if you are a vulnerable or medically dependent consumer, as the power company has to follow certain guidelines regarding what they should do before taking that final step of disconnection. This includes trying to find alternative ways for you to pay, or referral to a budgeting advisor or Work and Income (with your consent). You would qualify as a medically dependent consumer if someone in your household depends on mains electricity to power critical medical equipment (such as ventilator). You would be a “vulnerable” consumer if you have genuine difficulty in paying your electricity bills due to financial hardship or if disconnection would threaten the health or wellbeing of someone in your household (such as someone who is elderly, has health problems or is a very young child). If you are having problems paying your bills, don’t just wait for the disconnection notice to arrive – tell your power company that you’re having trouble or get in touch with us, your local bureau. 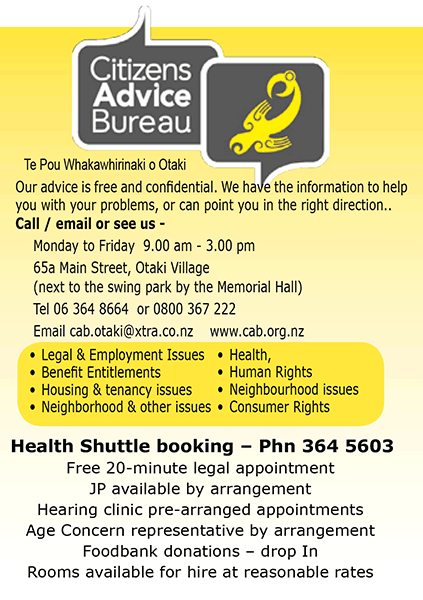 We are here to help you know your rights and entitlements (for example as a vulnerable consumer and/or someone eligible for financial assistance from (WINZ). We can also help if you have a problem with the way your power company is treating you and want to make a complaint. Come and see us, phone or email us. We also have information about your rights as an electricity consumer on our website www.cab.org.nz.